Crane started the National Trust line of sheds with the idea of making sheds that look just like those old, classic English style sheds that populated the East Anglian landscape many years ago. The Felbrigg Shed perhaps more than any other shed in this line captures that old school and somewhat vintage look that Crane were going for and we really love that. Offering a very nice looking apex style corrugated roof, vertical sawn board cladding (now that is what we call a throwback to classic sheds!) 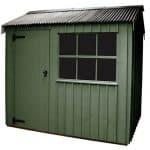 and just it’s general style add up to make this a very nice looking shed. While this may lack the jaw dropping first impression its big brothers in this line may have, The Felbrigg Shed really does capture the look and feel that Crane were going for in this line. This is a shed where the first glance may not seem all that impressive, but the more you look at it and once you touch and feel just how well built it is, you will start to appreciate the work that went into crafting this shed. Amazing apex style corrugated roof! It costs just under two grand! 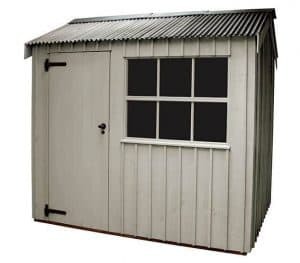 We have our clipboards, pencils, Bunsen burners and lots of other scientific equipment so we can put this shed through its paces and see if it is worthy its rather high price tag! This is actually the “mid-size” version of the Felbrigg Shed and we feel that it does offer a good and practical amount of space. We are sure that for the average gardener or just a person who has been forced to move all their……… what your significant other refers to as junk out of the spare room will have more than enough space. You have 9 feet 8 inches in the length department along with 5 feet 9 inches of width. So you can see, you will have a lot of floor space so if you plan where you are storing things, you will have a lot of room. The height at the ridge is under 8 feet to stop the need for planning permission, but at the same time give you enough room to walk around comfortably. One thing that we were impressed with was the eave height which is just over 6 feet high. We love a shed that offers some good head room and this shed certainly does that. The roof is an apex style roof and that is something we love. It first of all gives you that little bit extra head room at the ridge, but it makes sure that the rain does not sit on the roof and find its way into your shed. Instead of using roofing felt, Crane use a corrugated roof. First of all this looks really great and gives the shed a very classic” look, but it also will hold up for many years. So yes this kind of roof does make the price creep up, but it will be reliable and last a very long time. 16 x 125 tongue and groove boards are what is under the corrugated roof and this boarding is more than up to the task of keeping that roof up. We are sure that on paper when you read, sawn board cladding that it may not sound all that exciting and perhaps even kind of cheap. Well this kind of cladding has not been used so Crane save a couple of quid! It has been used because this is what old East Anglian sheds looked like! And you do not have to worry about it being cheap because this cladding is 16 x 38 and is made from some of the toughest wood in existence, Scandinavian Redwood. So not only are you getting that classic look, but you are getting a shed that could take a few punches from Mike Tyson….. that is how tough this wood is! That tough sawn board cladding would be worthless if the frame of the shed was weak, but Crane are using that same, Scandinavian Redwood all throughout the Felbrigg Shed and that includes the frame. 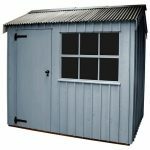 We think that the 38 x 50 mm frame that holds the shed together is just fantastic and makes this a shed that if you do have kids will be able to take a blast with a football, being ran into or any other kind of abuse that kids……. For some reason love to give sheds! This is a frame that will still be just as strong many years after the shed has been built and we think that is just amazing and in a way does start to make the high price seem more reasonable. When it comes to the flooring as is the case with most sheds, Crane have made the decision to use the same boarding they use on the roof for the floor. This is that same, 16 x 125 tongue and groove boarding. Under these floor boards we have some strong, 38 x 50 mm floor joists again made from that same, Scandinavian Redwood. 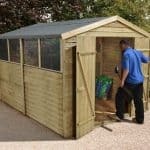 This is a great combination that gives the shed a very nice and strong floor which will be more than up to the task of storing a ton of different things be it your gardening equipment or things you are no longer allowed to keep in the house! 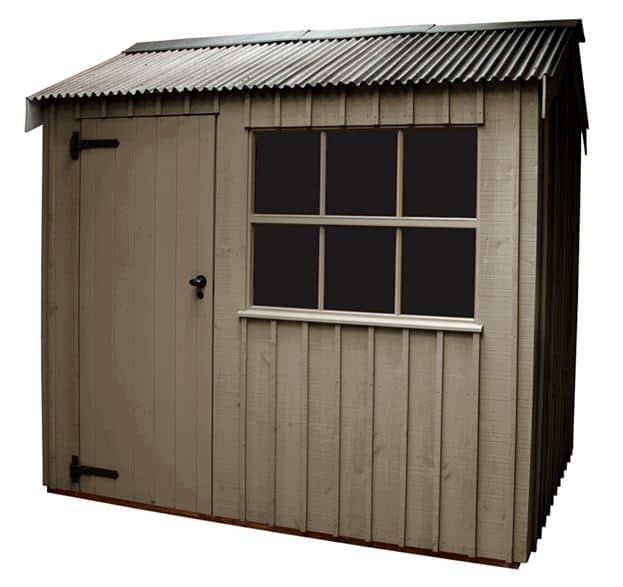 The shed comes with what we feel is a fair two year warranty which will see Crane come and make repairs or replace a part of the shed if there is a fault. There are a few “terms” when it comes to the warranty. For example when Crane install your shed if you tell them to place the shed in an area they deem “not suitable” then you will not be covered. Also the shed is only covered against general wear and tear. There is a lovely window on the Felbrigg Shed and it is something we think really stands out. It is made from this incredibly strong 4 mm glass which has been toughened to give it just a little bit more strength. It is almost like the folks at Crane know a football will be heading in the direction of this window at some point! Using real glass is something that we really like as more and more sheds opt for a cheaper alternative these days which may save a few pounds on the overall price, but there is no denying that a glass window always looks best. Some sheds have doors that are so weak you can pretty much pull the door off without any real effort! That is not the case here, thanks to those good, solid door hinges and the mortise lock and key that come with the shed, you will be more than confident that no one is getting in this shed without the key! The window does mean people can peek in and see what you have inside, but that is something we do not think is a big deal and while some may want to add a curtain, we think that would take away from how nice that Georgian window looks. Crane do offer a great variety of paint to finish the shed and really bring it to life. They have six different colours and each one has its own unique style. Brown, green, grey and blue are some of the shades that are on offer here. It is more than fair to say that no matter what your style is that Crane will have a colour you will fall in love with. 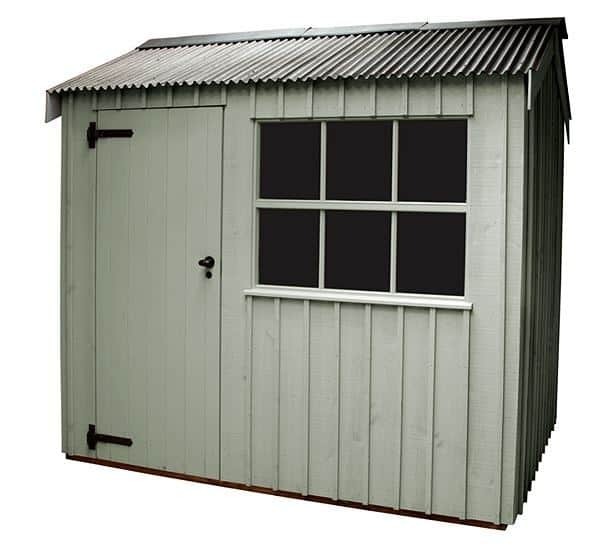 Adding the right colour to this shed just gives it that little bit more personality and makes it stand out more in your garden. Look we know the price of this shed is high, but there is no getting away from the fact that this is a high quality and well-built shed. 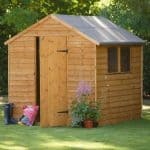 You simply cannot buy a shed that is this high quality and not to expect to pay a fairly big price for it! Crane only use the finest materials on this line of sheds. Starting with that corrugated roof and going all the way down to those strong as an ox, floor joists. 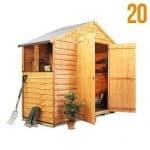 The Scandinavian Redwood, roof, toughened glass and the way the shed will be built all add up so that you have a shed which will last for a very long time. 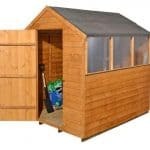 We think that for the average garden a 6 x 10 size shed will offer more than enough storage space. Thanks to that strong, sawn board cladding the walls are more than strong enough for you to put some shelves up if you want to make it so you have even more space to play with. Crane themselves will be who install the shed for you! No stress, no hassle and no broken or cut fingers either! As well as you not having to get your hands dirty, you also know that the shed will be built the way it is supposed to be. Just under two thousand pounds for a shed of this size on paper seems incredibly steep, but we must stress this is a high end shed that is made from the finest materials and has a great “retro” design to it. 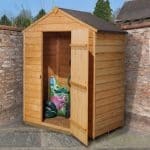 You are not just paying for a place to store your items, you are paying for a feature in your garden when you buy this shed. Final Thoughts: The Felbrigg Shed is a shed that really does capture the exact look that Crane were going for when they started this line of sheds. Made with just top of the line materials throughout, we cannot help, but really like this shed. 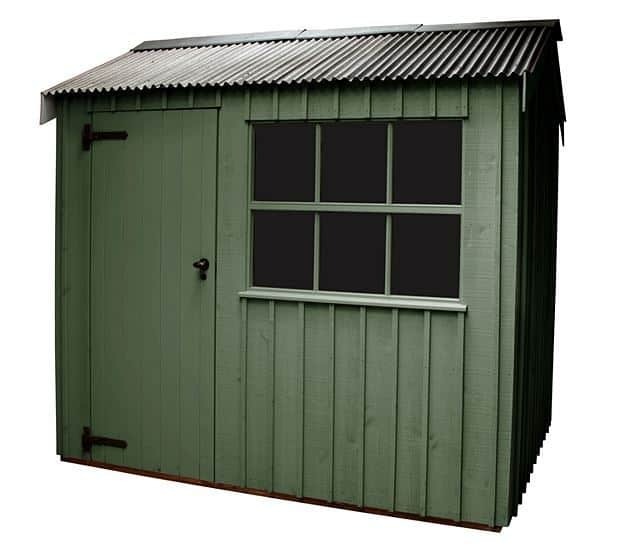 But we must say this (like the other National Trust sheds) is at the high end when it comes to its price, but you do get what you pay for and as much as you are buying this to store your mower, tools or whatever. 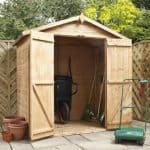 We feel that this is a shed you buy because you want a shed that compliments the rest of your garden……….. but if it is purely for storage you are looking at this shed then the price does seem kind of steep.